Okay I know I am not the only person out there who has an issue with dry skin over the winter time. Summer not so much due to all the sunscreen I lather on at work, needless to say my skin stays quite oily for those few months. So how do we get rid of that itchy dry irritating skin and scalp? Here are a few tips to put in your back pocket for the long dry winter months. If you are seeking a more natural way to keep your skin healthy I would start with the soap you use everyday for your face and body. Over the years there are a few key ingredients to soaps that have helped immensely: Glycerin Soaps, Olive Oil, Tea Tree oil, Coconut Oil, Jojoba Oil, Almond Oil, Wheat Germ Oil. Jojoba Oil: the skin strengthener. Similar in structure to that of natural sebum, jojoba oil can help reduce the production of oil while strengthening the epidermis. Tea Tree Oil: antifungal and antibacterial. Tea tree oil has been used for centuries to heal the skin. In addition, it carries oxygen into the hair follicles, reducing and killing the bacteria that lead to pimples. Almond Oil: the skin soother. Used for centuries for its ability to nourish, almond oil is ideal for soothing sensitive skin. Wheat Germ Oil: the acne fighter. A rich source of omega-3 and omega-6 essential fatty acids, wheat germ oil is effective in treating acne and blemishes, and provides antioxidant protective properties. Olive Oil: It is a great skin moisturizer, in part because it contains linoleic acid, a compound not made by the body, but which prevents water from evaporating. Glycerin Soaps: are soaps that contain glycerin, a component of fat or oil. They are very mild and rich in moisture. Coconut Oil: For skin it is a moisturizer, antibiotic, multivitamin, multi-nutrient, nourishing, anti-aging, anti-wrinkle and anti-oxidant. The best and most skin friendly form is Pure Virgin Coconut Oil. We just got done making a batch of natural Olive oil soaps infused with hand-picked fragrance. I gotta say it is very refreshing to wash my hands with a soap that doesn’t instantly make them feel dry and itchy. So the next time you are at the store or your local farmers market, cruise on by the soap area and see what natural soaps you can find. You may pay a little bit more but your skin will thank you a million times over. We have a little market shop downtown Coeur d Alene called “Pilgrim’s Market” that has a little bit of everything “Natural”. It has to be on of my favorite places to shop for all my homeopathic remedies and organic cravings. Their website is still under a little construction but if you are in the area or want to check it out I highly recommend it! It has my favorite Homemade Soaps, Raw Cocao Nibs for homemade chocolate, tasty fresh snacks, and a wide selection of hand crafted beers and wines. The produce is incredible and the selection is amazing. Here you will find all the supplements one could desire for all homeopathic needs. Whenever my boyfriend and I get the time, we like to roam around Pilgrim’s and see what new things they have to offer. They have expanded over the past few years and are now a booming Market full of bulk foods, health and beauty products, groceries, even meat and sea foods! If you are in need of natural ingredients, healthy treats, luxurious soaps, and live near Coeur d Alene then I encourage you to stop by Pilgrim’s and see all they have to offer! Another awesome experience in our area is the Farmers Market. 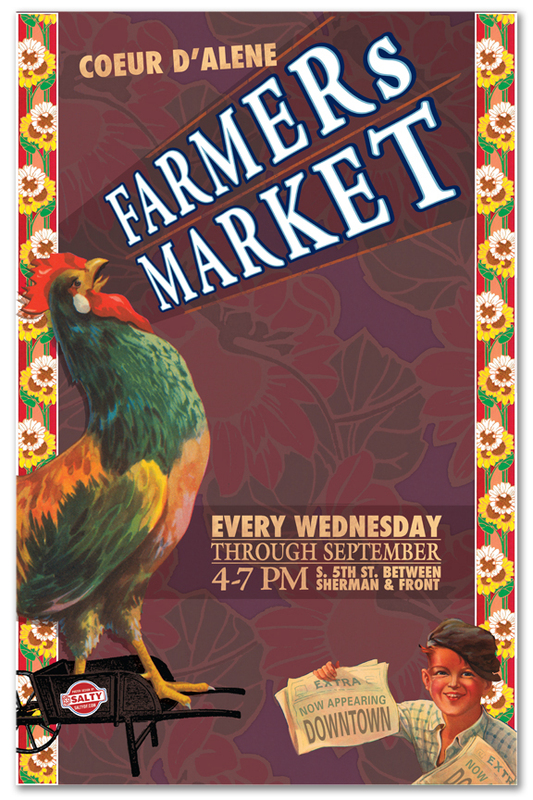 It is a fantastic place set up for locals to come and share their produce, creations, talents, and so much more! There is something interesting at each booth. Me and the kids love touring around the Market and getting goodies. There is so much diversity in the crafts that you will definitely find something you like. Check out the website to see what music will be playing! They are there rain or shine. I look forward to checking it out this summer. It’s your turn! What are the cool things your community offers that you enjoy over the relaxing summer days? I would love to see what you all do in your neck of the woods. Each town has its own culture, and its own creative experiences to offer. I learning about whats out there, and maybe add it to a road trip itinerary.